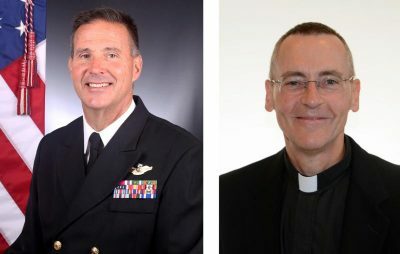 UPDATED – WASHINGTON (CNS) — Pope Francis has named Father Joseph L. Coffey and Father William J. Muhm as auxiliary bishops of the U.S. Archdiocese for the Military Services. Bishop-designate Coffey in a statement credited those who have led the Philadelphia Archdiocese over the years — Cardinal Anthony J. Bevilacqua, Cardinal Justin Rigali and Archbishop Charles J. Chaput, Philadelphia’s current archbishop — for allowing him to serve in the military as a chaplain. Meanwhile, Bishop-designate Muhm in a statement said he was “humbled and honored” by his appointment. Archbishop Chaput said the Archdiocese for the Military Services and the people it serves “are receiving a gift from the Holy Father” in Bishop-designate Coffey.